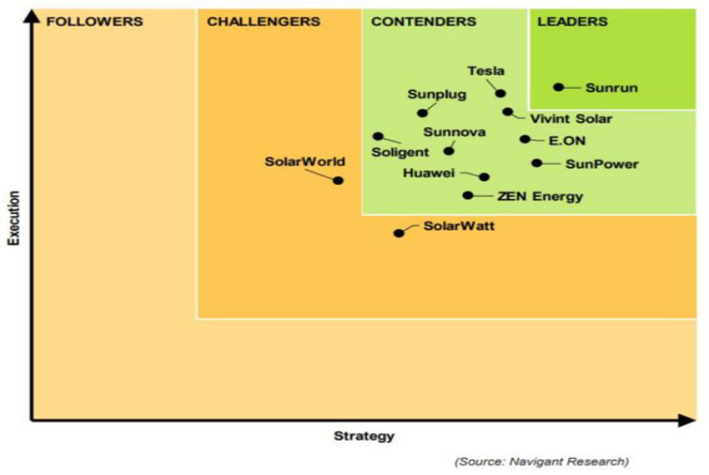 In October 2018, Navigant Research released its “Leaderboard: Residential Solar PV Plus Energy Storage Providers” report. The report analyzes the top 12 most active current global residential solar-plus- storage vendors according to their strategies and implementation. The report scores the companies according to 12 factors, including vision, go-to market strategies, partnerships, production strategies, technologies, geographic reach, sales, marketing and distribution, product performance, product quality and reliability, product portfolio, pricing, and staying power. Combining statistical analysis with the scores for each company, Navigant released a top 10 list of global residential solar-plus-storage providers. The purpose of the list is to provide industry members with an objective review of the strengths and weaknesses of these global residential storage suppliers. Energy storage combined with solar PV can solve problems that solar PV systems on their own cannot. Independent solar PV systems can only generate electricity when sufficient sunlight is available, therefore it is unable to provide many services that other power generation resources can. Over the past five years, solar PV and energy storage installation costs have dropped considerably. It predicted that costs will continue to drop, particularly for residential solar and storage systems. Solar and storage systems that have had their performances verified can help bring solar and storage hardware and software resources to compete in the global retail power market. Residential solar, energy storage, and other resources can integrate using virtual power plant networks, allowing distributed energy resources to be dispatchable, saving on electricity costs, decreasing intermittency issues, and providing grid services. Within Navigant’s rankings, Sunrun placed first. According to Navigant’s analysis, Sunrun is the only company to show outstanding performance in both strategy and implementation, with a strong customer base and a number of verified systems in the market. Tesla and Vivint Solar followed closely behind, though ranked lower in sales, vision, and market attractiveness. SolarWorld and SolarWatt have also been consistent challengers, though their products have not yet demonstrated strong business case examples. According to Navigant’s analysis, the top 10 global residential energy storage providers include Sunrun, Tesla, Vivint Solar, E.on, Sunpower, Sunplug, Sunnova, Huawei, Soligent, and ZenEnergy. To learn more about Navigant and access the report, view the official press release here.